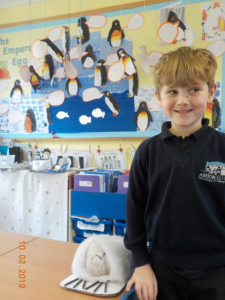 This term we have enjoyed learning all about Emperor penguins. We’ve researched and found out so many interesting facts! 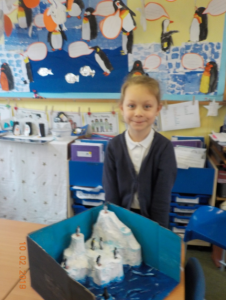 Did you know a male Emperor Penguin is approximately 1.3m tall? 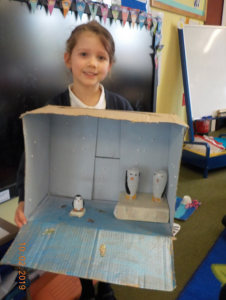 Or that the male penguin looks after the egg while the female penguin fishes for food? 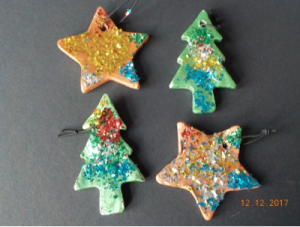 As Christmas approaches, we are feeling rather tired; not only have we been busy accompanying The Jolly Postman on his deliveries around Fairy- tale Land, we have also been making our own Magical Christmas Journey. If you came to watch, we hope you enjoyed it as much as we did. We have been spotting 2D and 3D shapes everywhere after learning about them in Maths. We have also been comparing numbers, thinking about which numbers are larger, smaller, or the same as each other, and explaining how we know. We were so good at this that we introduced the greater than, and less than symbols. A greedy crocodile dropped by to help us remember which way around we need to write the sign. 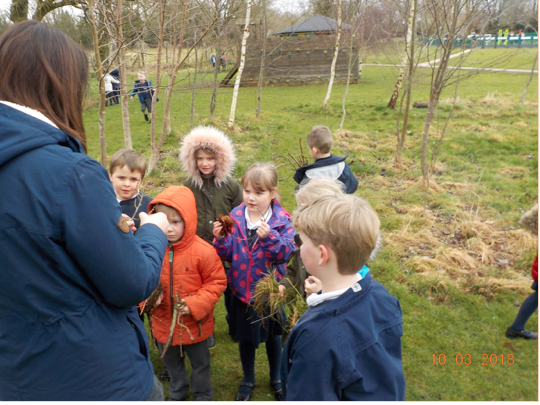 In Forest school, we enjoyed making bird feeders from willow. 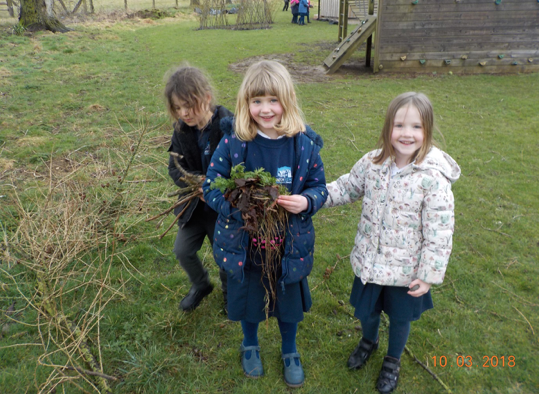 We found it quite tricky to weave the willow, but we persevered and achieved some great results. Author Tracey Corderoy made a second visit to our school to share some of her new books. 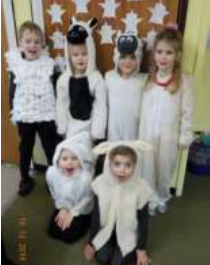 We were all enthralled during the whole school assembly when she read Christmas Extravaganza Hotel, and were then lucky enough to join Year R in a workshop based around Fairy Tale Pets when we all made grumpy baby bear hand puppets. We had great fun at the end joining in with an alternative and chaotic version of Old MacDonald! 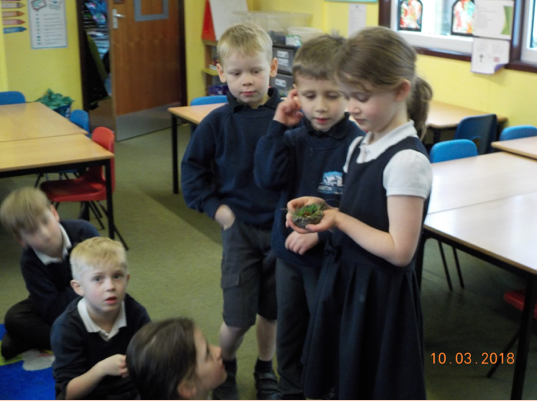 Before we said our farewells to Miss Froggatt, she worked on some exciting science investigations with us. 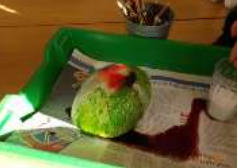 Our class favourite was one using, ice, food colouring and salt. We discovered that the salt seemed to make the water melt more quickly. To commemorate the 100th anniversary from the end of WW1, we created our own wreath, made up of both red and purple poppies to remember the soldiers and animals who gave their lives. 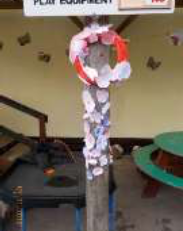 We attached it to the pole in our outdoor area, but the very windy weather meant that many of the poppies blew off before we were able to share it with you. On the 1st December we welcomed a new, and somewhat cheeky, member to our class. Snowflake, the Elf has been up to all sorts of mischief since she arrived; partying with her friends, drawing on the fruit, swinging from the ceiling to name but a few! On one occasion, she brought her friend Frosty to meet us, but sadly, by the time we arrived Frosty was a puddle of water, a carrot nose, scarf and a few buttons! Poor Frosty! We can’t wait to see what she has been up to each morning.Merry Christmas from Year 1. 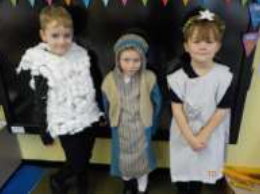 Class 1 have enjoyed a busy and exciting start to the year! 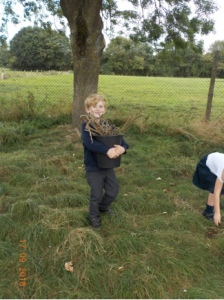 In forest school, we collected natural materials to make an insect hotel. We thought carefully about which materials would be suitable and we had to make sure the hotel was really secure so that no bugs would stay safe! In English we are reading and learning all about Traditional Tales. 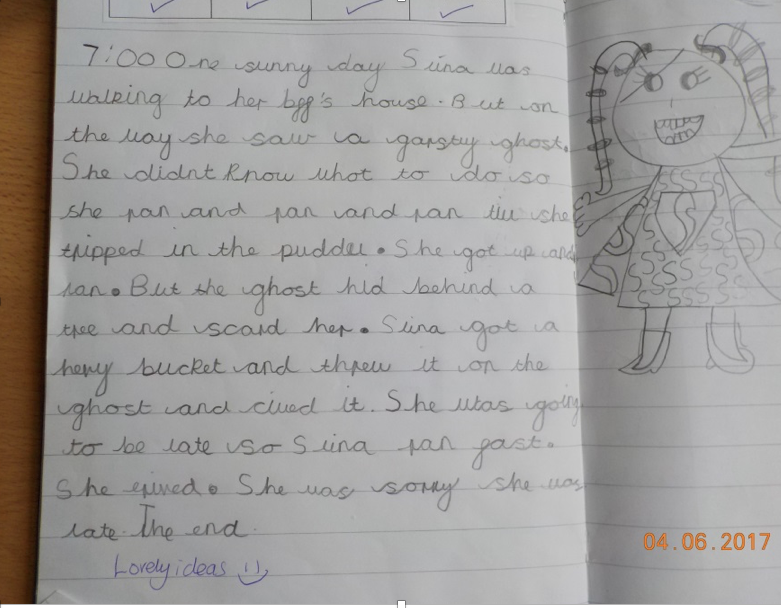 We have learnt to retell the story of ‘The Magic Porridge Pot’. 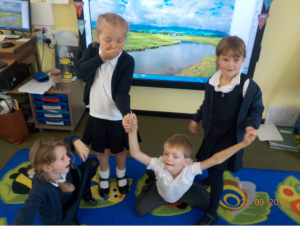 As part of our learning, we worked in groups to role play parts of the story and create freeze frames. Then we wrote about what each character might be saying, thinking or feeling. 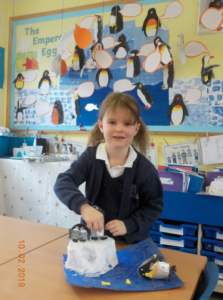 During Science Week we had fun challenging ourselves to see if we could be better nest builders than birds. We had to make nests which were cosy, safe and wind proof. We used natural materials we found around the outdoor area and each group also had some clay. There were many different ideas and creations. Making a nest is harder than it looks! 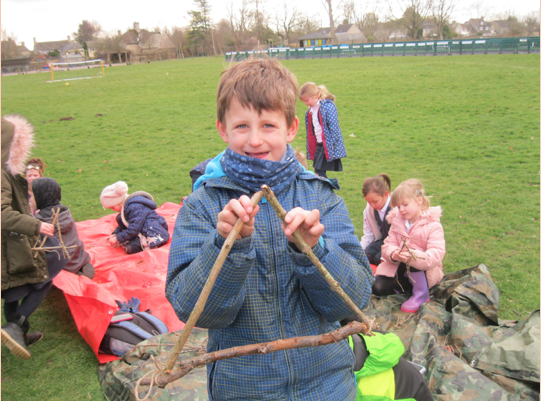 In Forest School we explored 2D and 3D shapes. We used sticks to create 2D shapes and then used string to create 3D shapes including cubes, cuboids and pyramids. As part of our topic on ‘Grace and Family’ we designed a postcard using 2:Simple. We learnt lots of new computing skills including how to log on to the network, how to stay safe online and how to control a mouse pad. 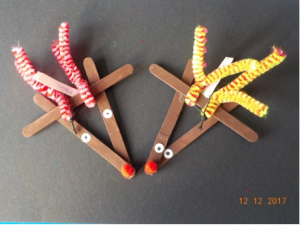 We used our D&T skills to design and make Christmas gifts to sell at the Christmas market. 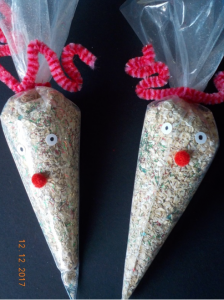 We enjoyed making them and raised lots of money towards our enterprise! Which one would you choose? 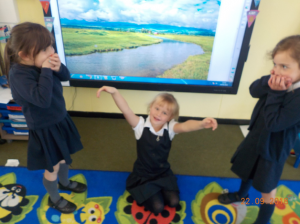 In English we’ve been reading and reciting poems from Julia Donaldson’s anthology ‘Poems to Perform’. It’s been great fun learning the poems and adding our own actions. To make our performance more interesting we varied the speed and volume of our voices. 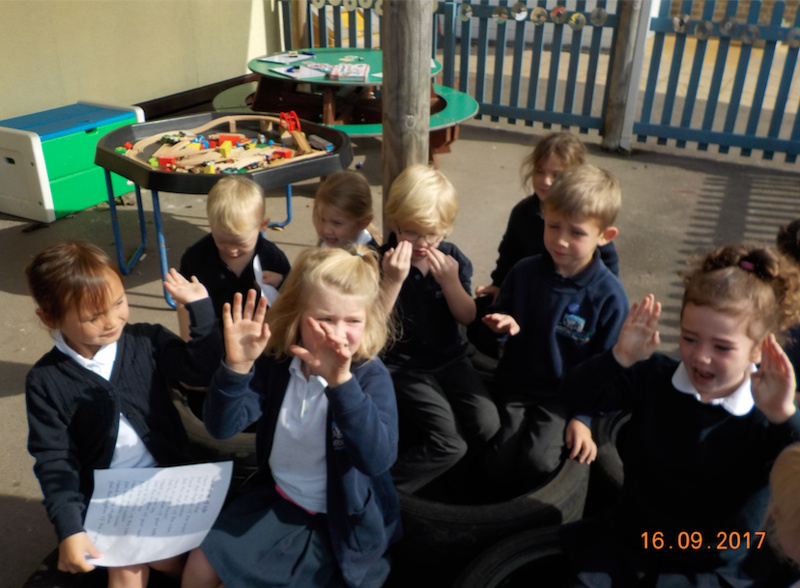 Here we are reciting ‘The Rhythm of Life’ by Michael Rosen. Class 1 and 2 had a fabulous day at Cotswold Wildlife Park, the children were incredibly well behaved and made all of the staff very proud. 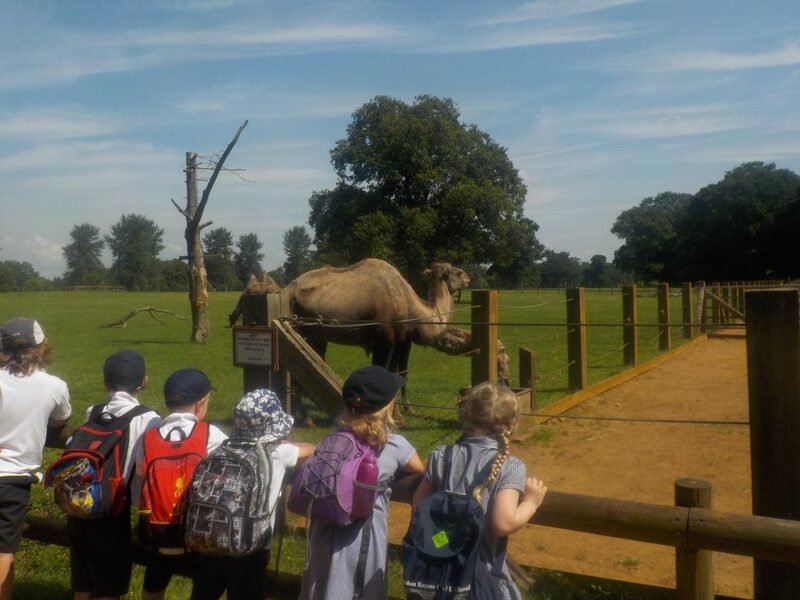 The children had the opportunity to look around the park and enjoy the animals. 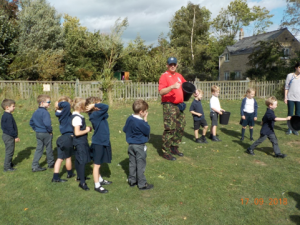 We also had a fabulous talk from one of the keepers at the park who told us all about the Zebras, Giraffes, Lions and Rhinos, we learnt lots of fantastic facts, which hopefully your children have already shared with you. We are now looking forward to our new book ‘One day on our blue planet – in the Savannah and all of the super writing and artwork that this will inspire. In Class One we’ve all been SUPERHEROS! We learnt to retell the story ‘Sid the Superhero’ and then adapted the story frame to create our own fantastic superhero stories. We experienced lots of role play and even had a Superhero challenge afternoon! 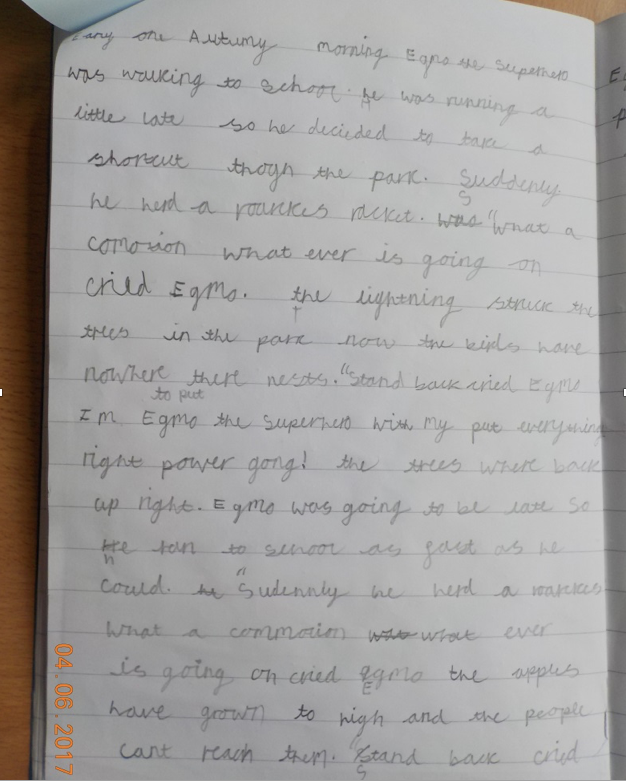 Here are some of our super stories. We had lots of fun during Science week. One of our favourite activities was making slime! We mixed cornflour and water until the slime was the consistency of thick honey. 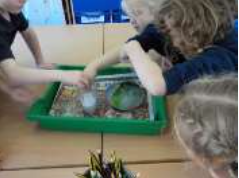 We loved getting stuck in and feeling the sticky slime. Once we’d made our slime we tried out some experiments to see how the slime reacted to rolling, stretching and being dropped from a height! 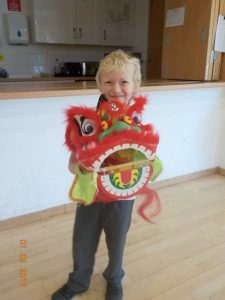 In February we learnt all about Chinese New Year. We practiced writing Chinese symbols and followed instructions to make mini Chinese Dragons. 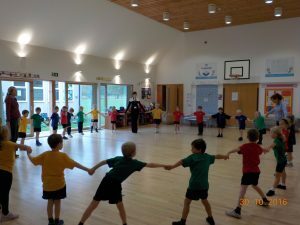 We were lucky enough to experience a dance workshop where we enjoyed listening to a story about ‘The Great Race’. This is Chinese tradition. 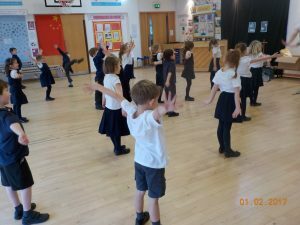 Then we learnt a traditional Chinese dance. We had such a wonderful time! 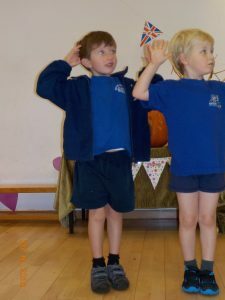 As part of our Diwali celebrations Year One and Two took part in a Diwali dance workshop. 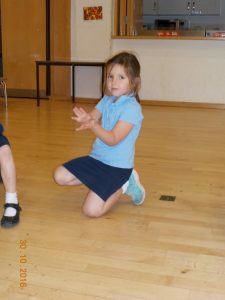 During the session we all learnt different hand movements for animals such as a dove, bee, eagle and fish. Ask one of us to show you! Then, we put the different movements together to form a dance and then performed to class R. Nano said, “I enjoyed it all,” while James said “I liked the body flick (the wave). Can you spell these words? 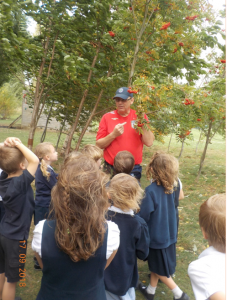 On Wednesday (5th Oct), Class 1 visited Holy Cross Church to Experience Harvest. We worked our way around the various stations to learn about the different ‘harvests’ the world give us. We demonstrated our current value of generosity by taking donations for Swindon Foodbank. We had a fun and informative morning and would like to thank Reverend Shirley and her team of helpers. What a lovely start to the year we have had. We started the term with a whole school week on ‘Spituality’. The children were asked what spirituality meant to them and words they associated with it. The responses were incredible; love, heart, God, friends, moon were just some. Come and have a look at our spirituality area near the book corner. In the second full week we looked at Bristish value where we learnt about how to be a member of Ashton Keynes and the British Society as a whole. We considered; listening to everyone’s views, knowing the difference between right and wrong, knowing that we are responsible for our behaviours and accepting that others’ may have different views and beliefs. 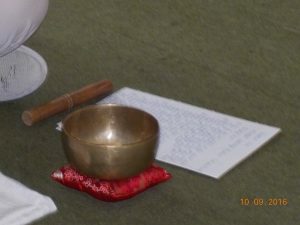 Additionally we had our first mindfulness session of the year. Ms Trowmans introduced us to the singing bowl, made from 7 types of metal.